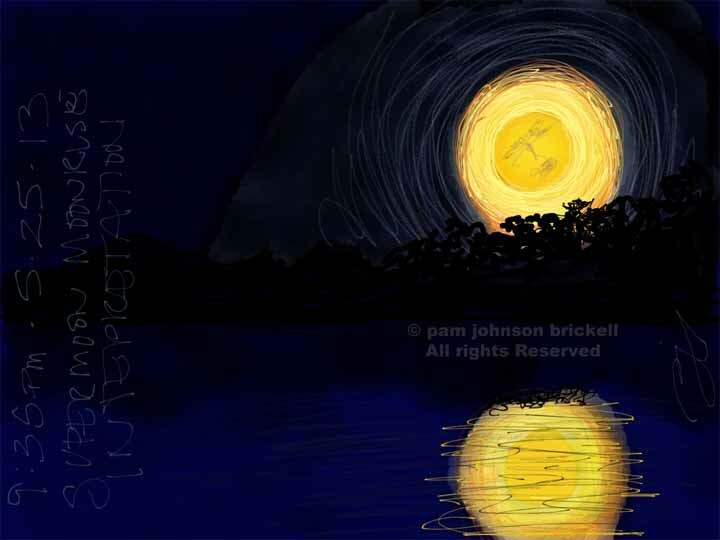 Last Friday evening while walking the dogs along the cart path on hole 17, the rising moon stole my heart. 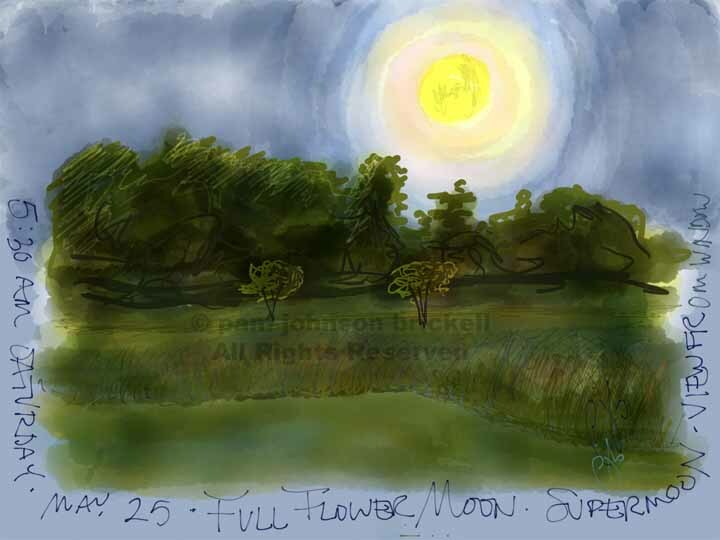 The high spring tide captured the reflection of this supermoon. 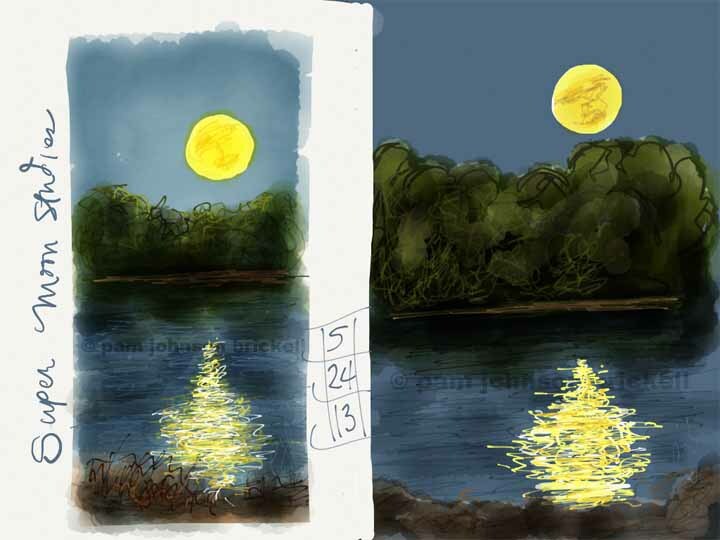 When we returned home, I recreated the scene on my iPad using the Paper 53 app. I created the image on the right first, but didn't like the sky so proceeded to sketch another on the left. 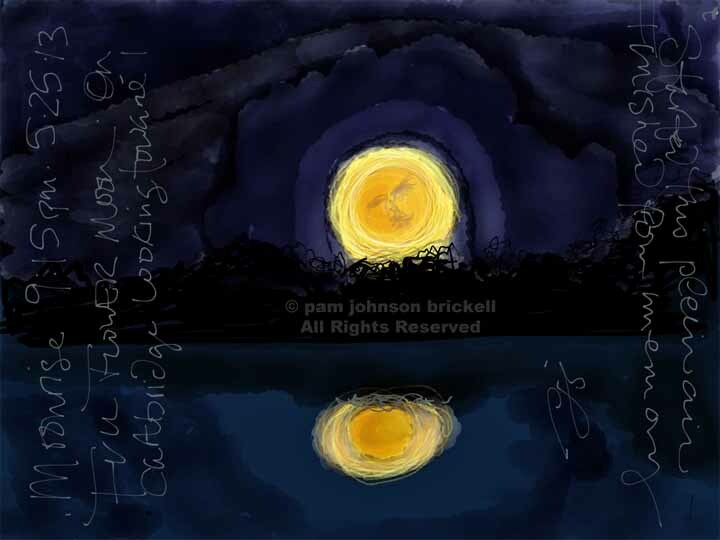 The calendar called for the moon to be full the next day. To my eye it was looking full already. What I didn't know at that time was technically, the moon would be at it's fullest at 12:30 am. Only four hours away. That evening, the moon didn't rise over the trees until 9:15. We were in the golf cart, and stopped on the cart bridge that leads to the 9th green. I started this piece plein air but the bugs became too numerous to continue. I enjoy working with the Paper 53 app. It's so easy to explore possibilities. I'm still learning so much abut the different tools and mixing colors. I love how I can make the moon as bright as I see it. Something that's not possible in watercolor. Started Plein Air, finished at home. Thanks, Linda. Working on the iPad does have a learning curve, but is lots of fun. I love how you did the reflections! Thanks for stopping by Jacqueline and for your comment! I love reflections in water and it's always a challenge to capture the wonderful movement of water. Hi Pam, I hope you will accept the following award below. It is offered in appreciation of all your inspiring works. Please keep inspiring all of us! Mary, Thank you so! I'm truly honored. 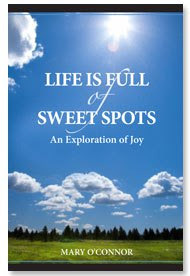 And, extra thanks for gathering such wonderful inspiration together in Life is Full of Sweet Spots!